If there’s anything that I learned from accidentally stumbling across Child’s Play on cable as an adolescent, it is that dolls are freaking evil. They are murderous, demon-spawn levels of terrifying, all melded into what should be an innocent plaything. So when I originally demoed Weeping Doll back in September, the premise of a demented, miniaturized human facsimile checked out in spades. Little did I know that the game would come back to haunt me again, only this time in review form. What a difference a month can make. As soon as you don the PlayStation VR, Weeping Doll transplants the player into a stereotypical Japanese home, if it were originally decorated in the 1950s. Between the guest room and the rather sprawling family room, it appears that the residents have either been living there for an extended stretch of time or they are big fans of antique furniture. Originally I wondered if the game took place several decades ago, but then I realized that I had a cell phone in my inventory. Well, so much for that theory. Though it never really comes into play during the game, it is hard to mistake the fact that you are actually playing the part of a female. This person, who seems to be an employee of the family, has been away for an undetermined amount of time and is trying to track down where everyone is located. Obvious vacancy be damned. It is high time to do what any uninvited visitor with a front door key would do: rummage through the homeowners’ belongings! It is only through this unfettered snooping that the truth become deathly apparent. Something has gone horribly wrong. The process of traversing the home is an interesting exercise in patience. Instead of providing smoothly scrolling front to back and left to right controls on the left stick, the developers have opted to take an alternate approach. The left stick is mapped to controlling a ghost image, with designates the player’s next desired location. Once the button to activate the movement controls has been released, the camera is zapped to this position. Also, the shoulder buttons can be tapped to rotate the camera in quick, jerky cuts. This is primarily done to help reposition the character so they are facing objects that they need to interact with. As bizarre as the control scheme feels initially, trust me, it doesn’t take long figure out. The player’s investigation consists of encountering blocked, and then suddenly unlocked hallways, obtuse puzzles, and tension-less exposition dumps from a disembodied voice. At one point you walk into the master suite, only to find that a massive, bank vault-sized lock engages on the doorway you just passed through. Only by hunting around the room for the one or two items that are actually available to interact with, will you actually stumble across the solution. Why is this heavy-duty lock even there? The narrative tries to play it off as a paranoid homeowner. Yet if a person were THIS worried for their own safety, why the hell is the door to their daughter’s room not similarly reinforced? Sounds like questionable parenting, if you ask me. And that is just the tip of the parental issue iceberg. Without delving too much deeper into the storyline, just know that this is a title that is trying to inspire tension and uneasiness, yet it only manages to create irritation and confusion. Also, the conclusion is one of the most absurdly sudden and needlessly abrupt sequences that I have ever encountered. It is a bad sign when the ending is so thematically dissonant from the rest of the game that I wasn’t even sure that the game was actually over. One other blemish of note is the awe-inspiringly terrible voice acting. This further drives home Weeping Doll’s cut-rate production values. It may not be House of the Dead levels of laughability, but it comes damn close. If nothing else, this has to be some of the worst voice work of the current console generation. Another key element that suffers from a dramatic lack of production values is the visual presentation itself. Unless an object is directly in front of the player’s face, it almost looks as if the camera has had Vaseline smeared across the lens. What makes this even more odd is that there is plenty of detail in the objects once they are approached, they are just not being fully rendered like that at a distance. When I originally previewed the game, I remember thinking that it might just be a technical limitation of the PlayStation VR headset itself. Now, after having an extensive amount of time to sample the device’s launch library, I can definitively tell you that this is not a technical compromise. This had to either be a conscious choice or an engine limitation of some sort. Regardless, the net result is still the same: an ugly looking game. Easily the biggest sin that Weeping Doll commits is the lack of any substantial narrative actually playing out on screen. Occasionally there were moments where a quasi-animation of sorts is shown, but this is just a weak attempt at building the tension. Aside from a ghostly apparition of some sort that the player is supposed to follow, there are literally no moving objects in the game that the player does not physically interact with directly. Furthermore, just trying to locate the object that needs to be interacted with, in order to progress the story, tends to lack any sort of genuine logic. Each room ends up devolving into a “let’s meticulously scan every inch, looking for the one glowing item that I missed the first time around,” game. If a game is going to cost ten dollars, features mediocre voice acting and graphics, and several illogical design decisions, it at least has to have a decent run time, right? Wrong again. Even with exploring every nook and cranny of the house, plus unlocking every trophy it has to offer (no platinum, by the way), Weeping Doll still clocks in at well south of an hour long. Honestly though, maybe brevity is the game’s greatest feature. 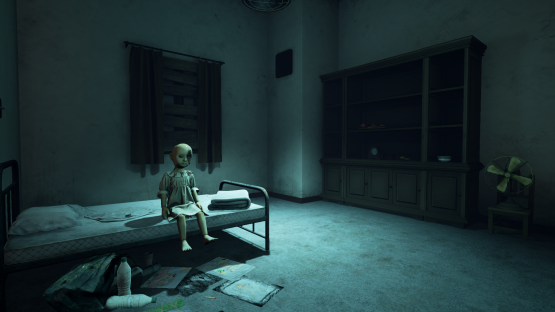 For all that Weeping Doll manages to achieve successfully, such as providing an interesting sandbox for the player to explore, it botches on the execution of so many other key elements. I genuinely believe that the game’s premise could have made for a terrifying experience. However, virtually every aspect of the design feels like something that was torn away from the developers before it was complete. Poltergeists beware! The only terror this will be inducing is from the poor folks that purchased the game before reading this review. Weeping Doll review code provided by publisher. For more information on scoring please see our Review Policy here.